Figure 2: Longitudinal Section of the El Sol Zone showing the intercepts of drill holes 16CLM-087, -088 and -089 projected to a vertical plane. Southern Silver Exploration Corp. is a precious metal exploration and development company with a focus on the discovery of world class mineral deposits in north-central Mexico and the southern USA. 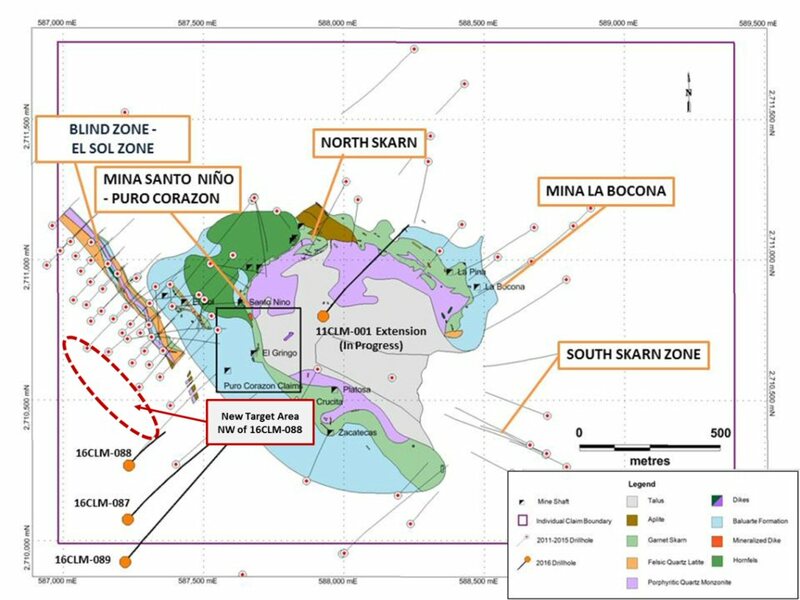 Our specific emphasis is the Cerro Las Minitas silver-lead-zinc project located in the heart of Mexico's Faja de Plata which hosts multiple world class mineral deposits such as Penasquito, San Martin, Naica and Pitarilla. We have assembled a team of highly experienced technical, operational and transactional professionals to support our exploration efforts in developing the Cerro Las Minitas project into a premier, high-grade, silver-lead-zinc mine. The Company engages in the acquisition, exploration and development either directly or through joint venture relationships in mineral properties in major jurisdictions. Our property portfolio also includes the Oro porphyry copper-gold project located in southern New Mexico, USA. The 2016 Cerro Las Minitas Resource Estimate was prepared following CIM definitions for classification of Mineral Resources. Resources are constrained using mainly geological constraints and approximate 10g/t AgEq grade shells. The block models are comprised of an array of blocks measuring 10m x 2m x 10m, with grades for Au, Ag, Cu, Pb, Zn and AgEq values interpolated using ID2 weighting. The models identified at a 150g/t AgEq cut-off, an indicated resource of 3,724,000 tonnes averaging 90g/t Ag, 0.05g/t Au, 2.3% Pb, 2.5% Zn and 0.09% Cu and a cumulative inferred resource of 6,611,000 tonnes averaging 82g/t Ag, 0.17g/t Au, 1.6% Pb, 4.3% Zn and 0.2% Cu. Mineral Resources are estimated using an average long-term price of $15/oz silver, $1,100/oz gold, $2.75/lb Cu, $0.90/lb lead and $0.90/lb zinc and metal recoveries of 82% silver, 86% lead and 80% zinc. All prices are stated in $USD. Mineral Resources are conceptual in nature and as such do not have demonstrated economic viability. Robert Macdonald, MSc., P.Geo, is a Qualified Person as defined by National Instrument 43-101 and responsible for the supervision of the exploration on the Cerro Las Minitas Project and for the preparation of the technical information in this disclosure.